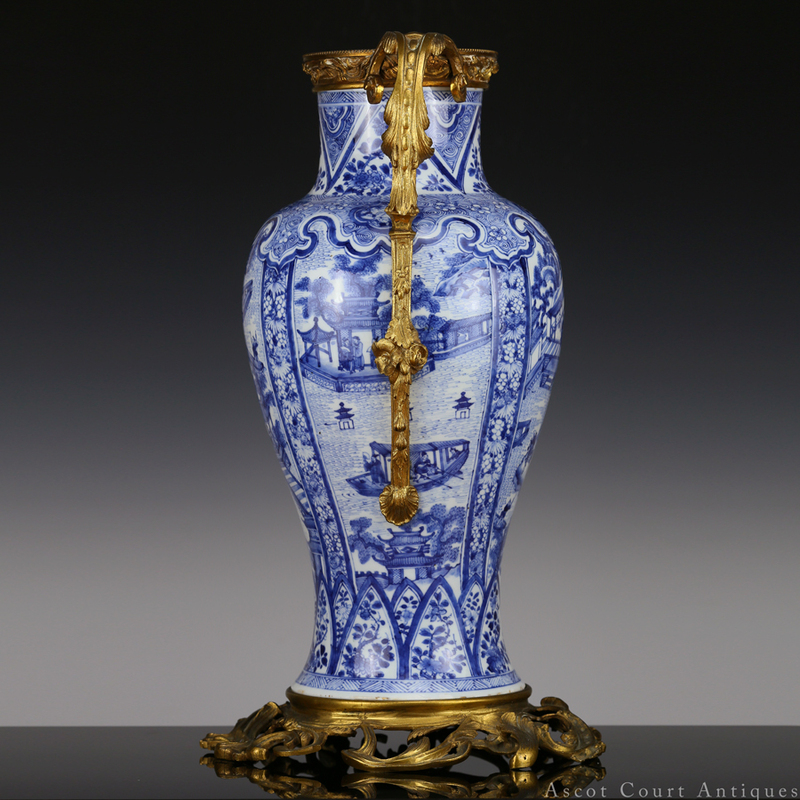 A very rare ca. 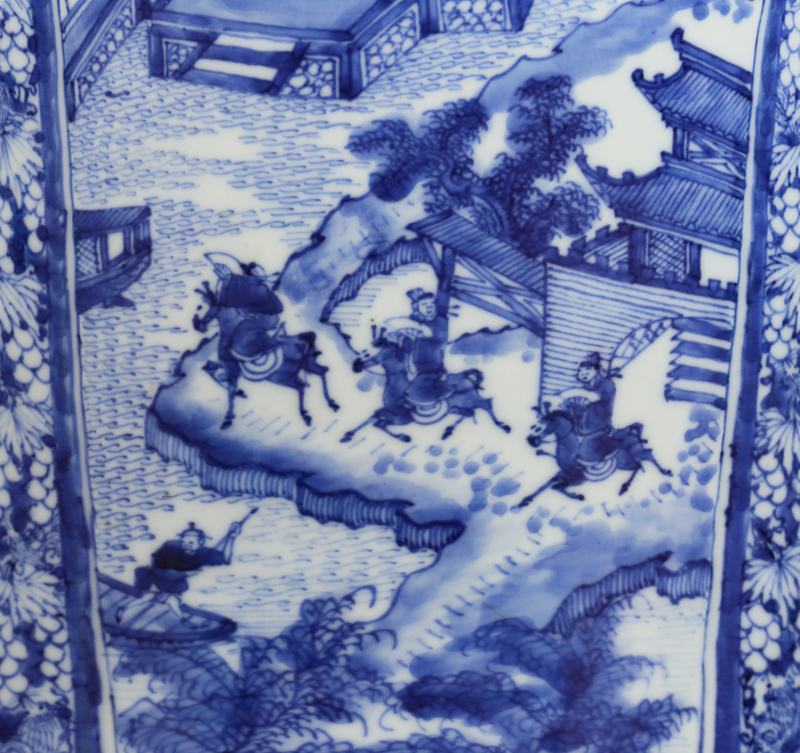 1662-75 early Kangxi blue and white vase, decorated profusely with scenes from the West Lake (xihu 西湖), showing the area’s numerous waterways and artificial islands, as well as people engaging in leisurely activities such as boating, sightseeing, meeting friends, horse riding, and drinking tea and wine. 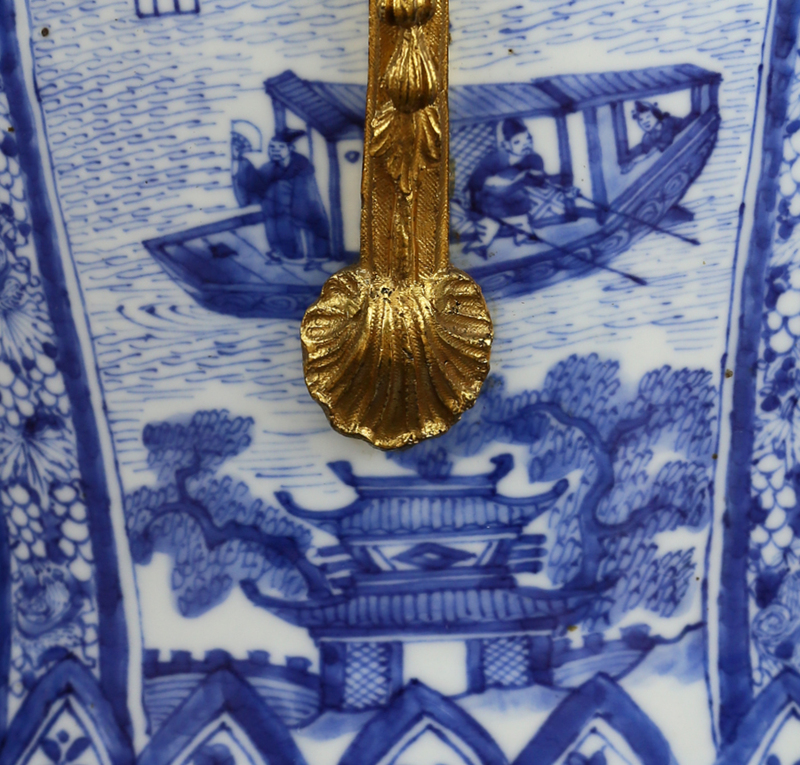 A side of the vase features two monks in a Buddhist monastery. 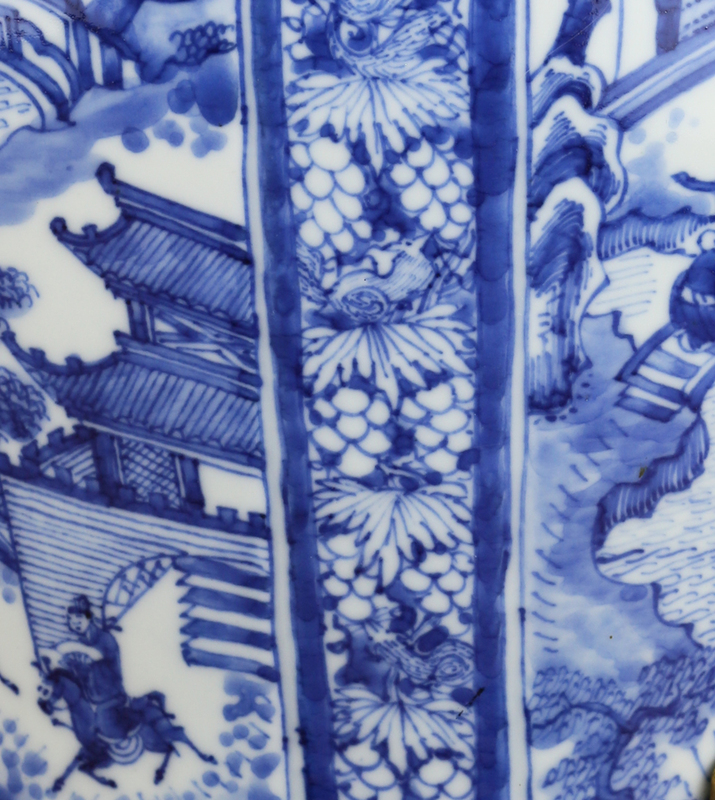 Each scene is separated by panels drawn with squirrels climbing amongst grape vines. 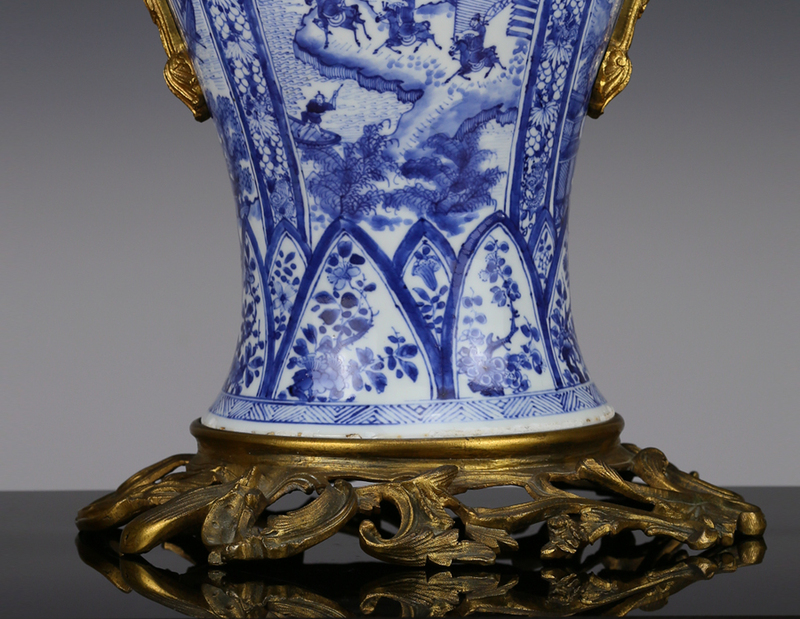 The foot is decorated with petal-like sections of floral sprigs, while the shoulder is lined with a ruyi collar filled with swirls. 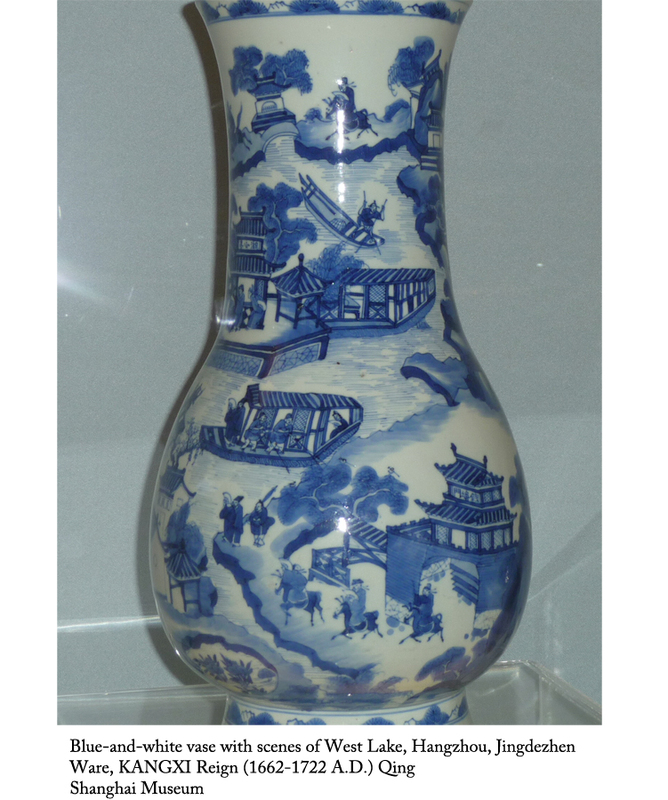 The West Lake scenes painted on this vase was likely sourced from popular woodblock prints of the day. 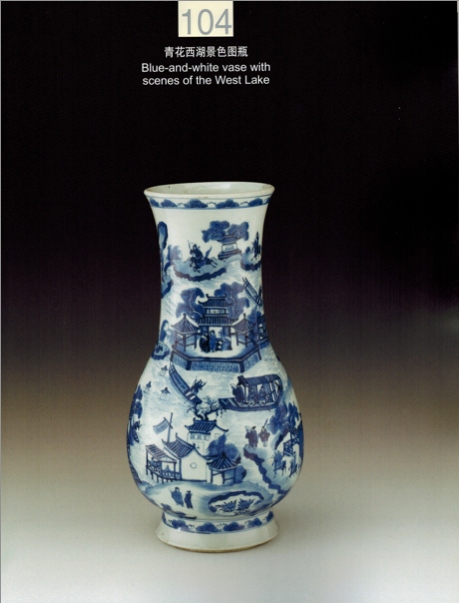 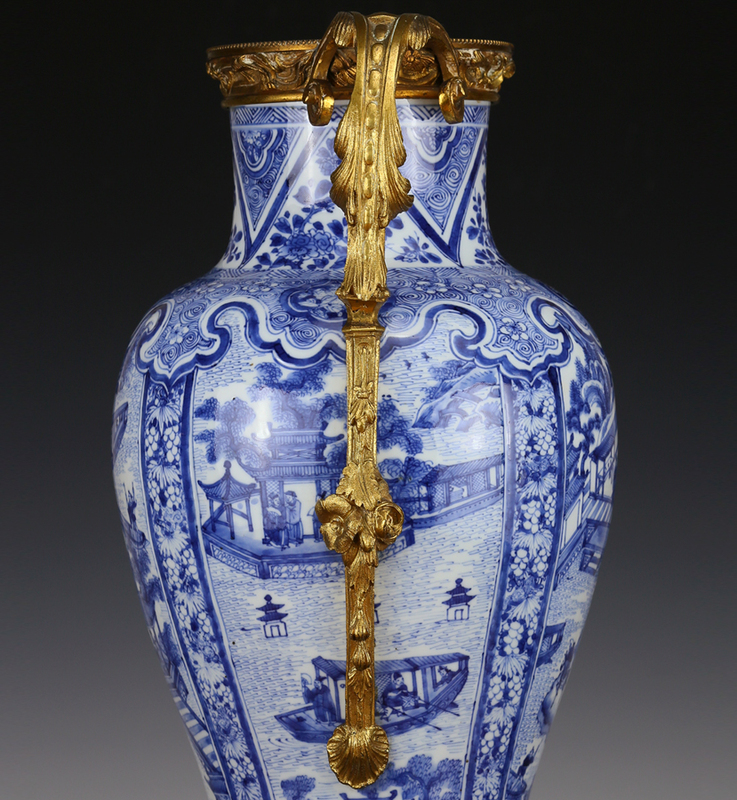 A similar (but slightly later made) vase, also featuring scenes from West Lake, is in the Shanghai Museum (see page 284 object 104 from “Seventeenth Century Jingdezhen Porcelain from the Shanghai Museum and the Butler Collections”, 2006). 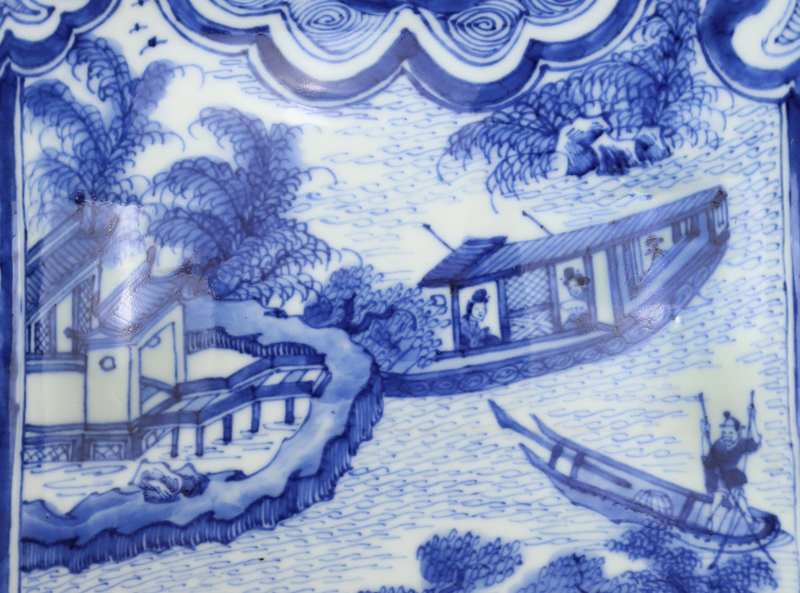 The West Lake is a freshwater lake in Hangzhou, and has been a famous tourist and scenic recreational area since the 9th century A.D. 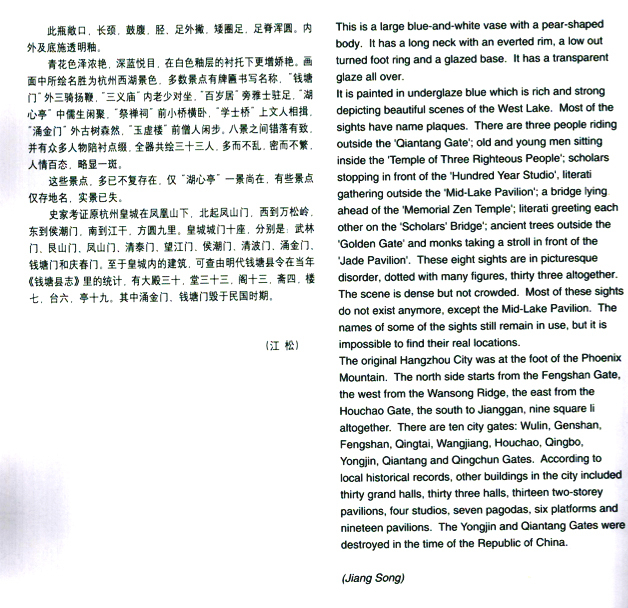 The Song dynasty poet Su Dongpo famously compared the West Lake to Xi Shi, a legendary beauty from the Spring and Autumn period (ca. 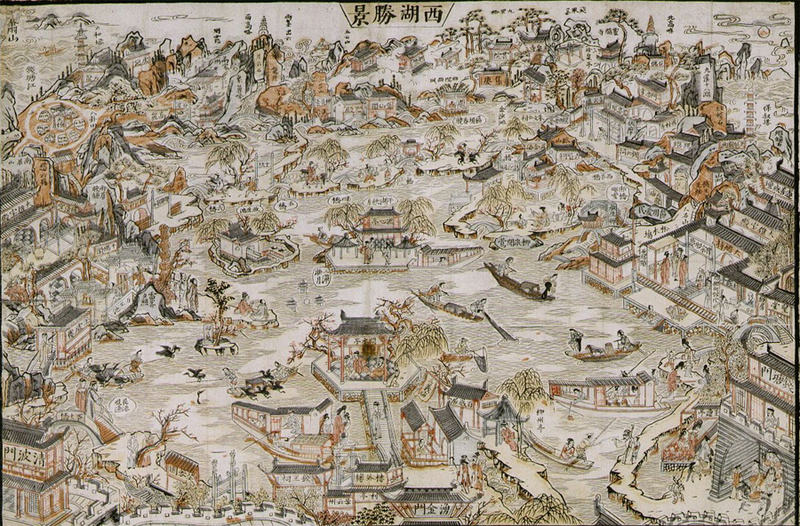 6th century). 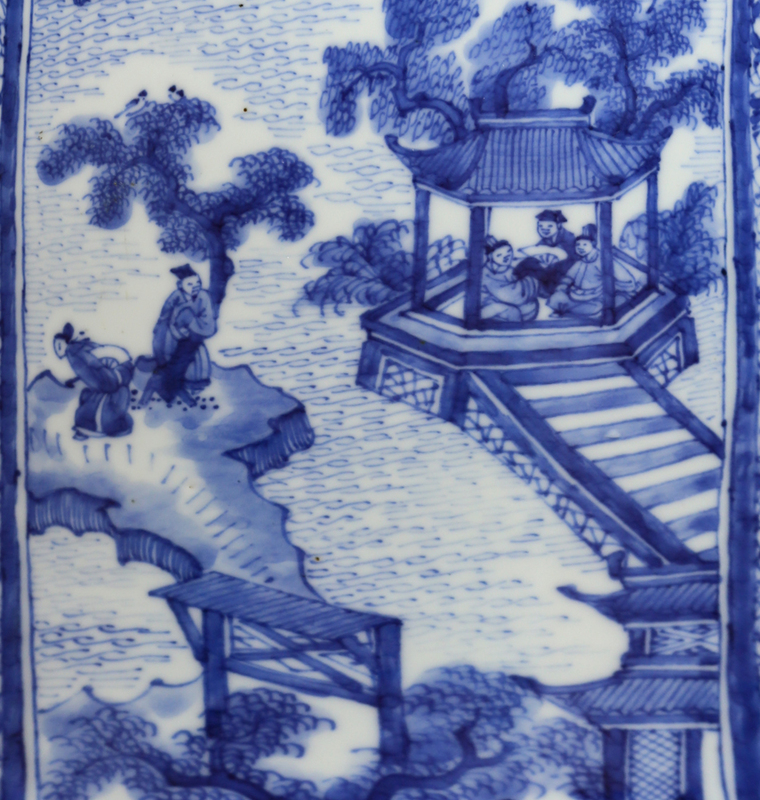 Centuries of dredging and landscaping has modified the Lake into a watery paradise full of artificial hills, islands, and waterways. 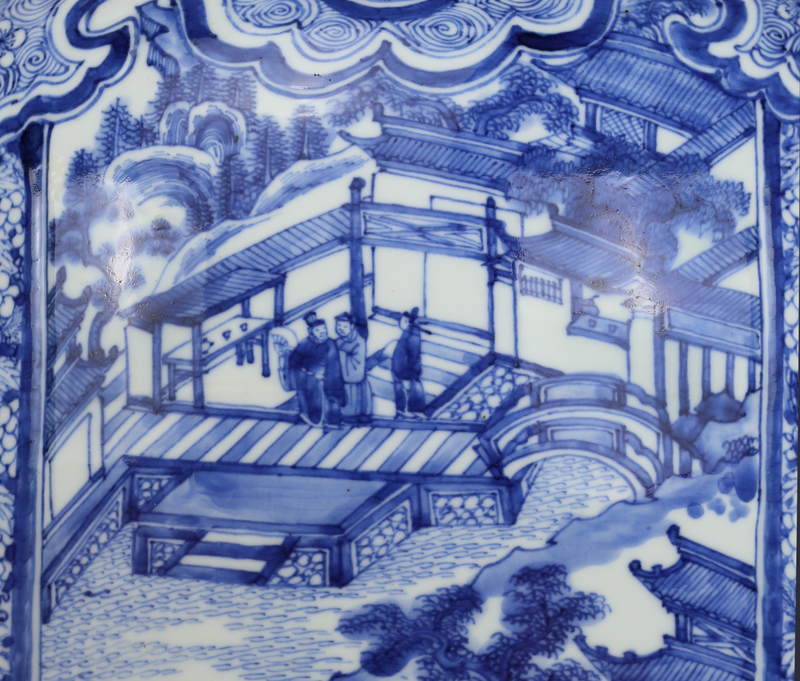 In the Qing dynasty it became an Imperial retreat; the Kangxi emperor himself visited the lake five times. 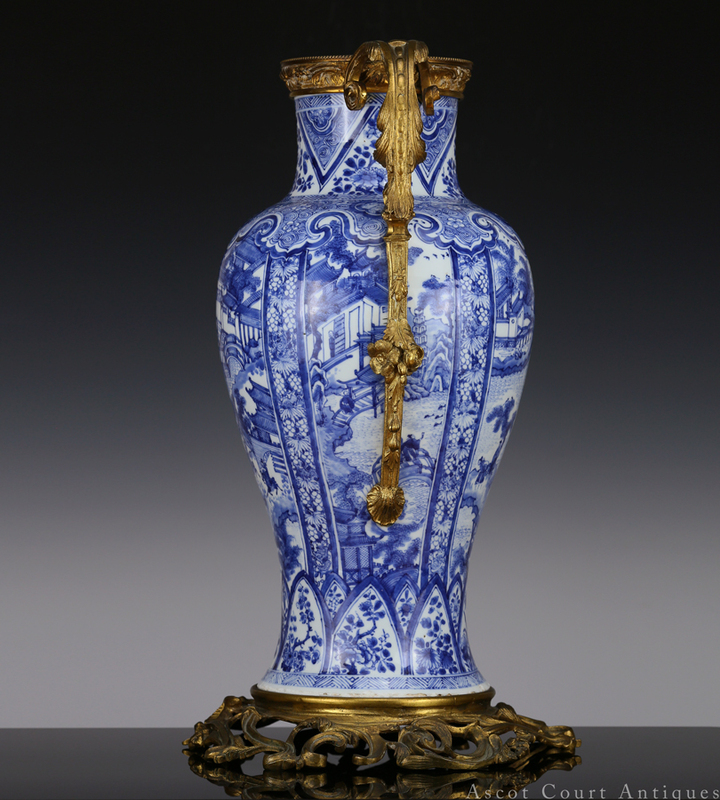 This vase can be dated to the 17th century early Kangxi period. 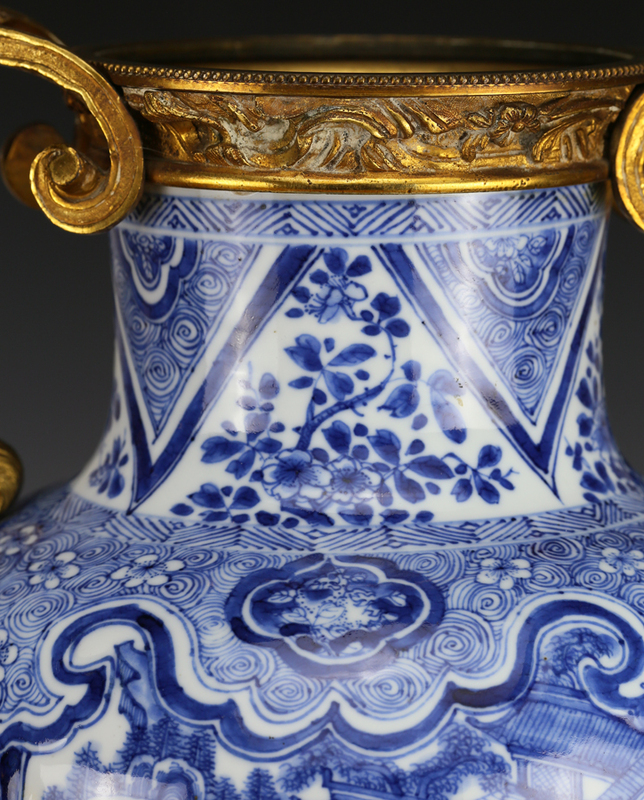 It is decorated in a linear ‘master of the rocks’ painting style rarely seen after 1675. 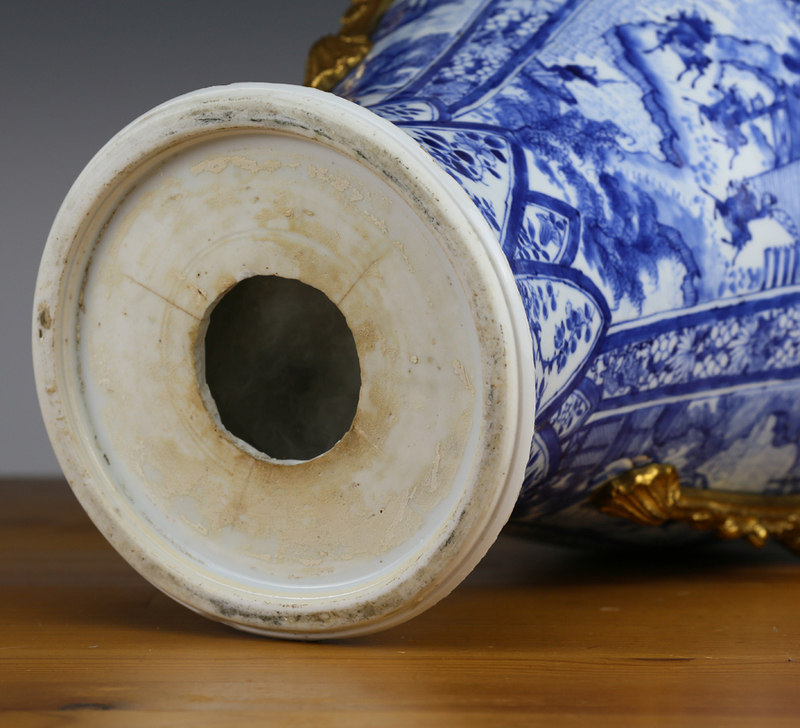 Its pure, brilliant shade of light blue and lightly spotted shading methods are also quite typical of the early Kangxi reign. 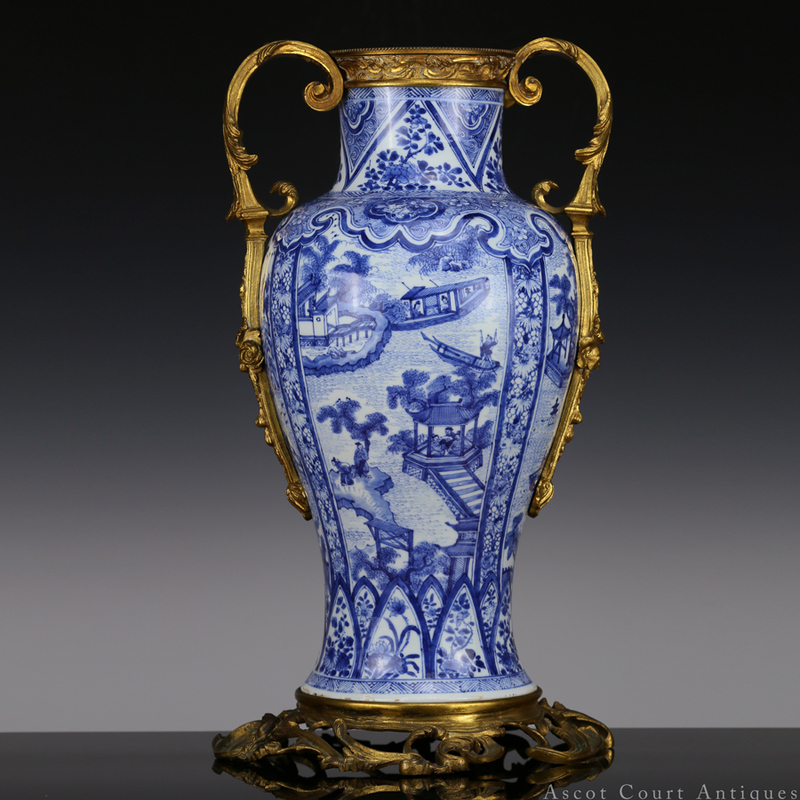 Sometime in the late 18th century, this vase was modified with rococo-style ormolu mounts in France. 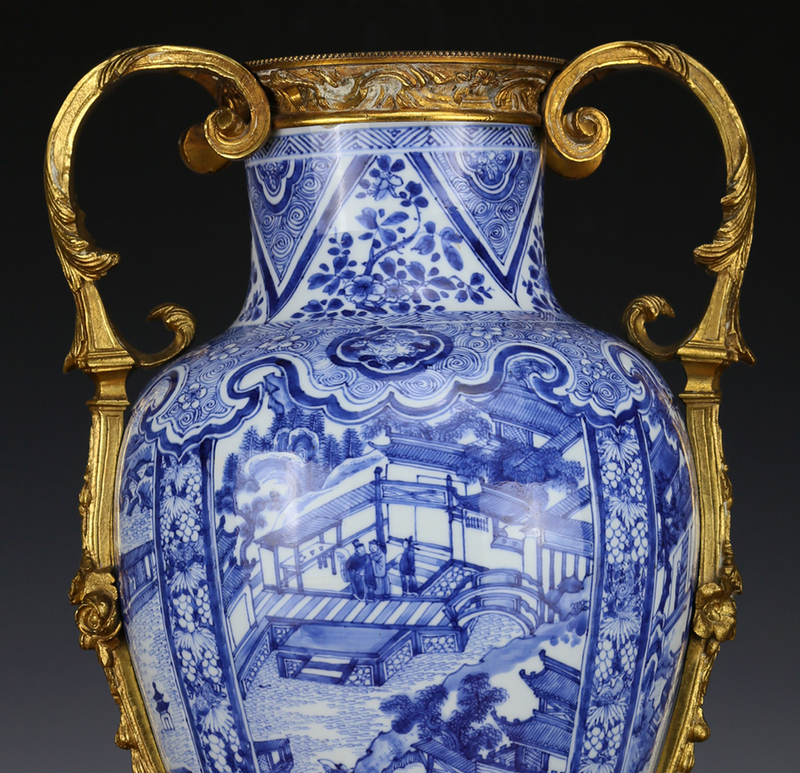 Ormolu mounting was a costly process in which porcelain vessels were fitted with custom-designed mounts, which were then cast by the lost wax method, and then chiseled and chased and veneered with gold. 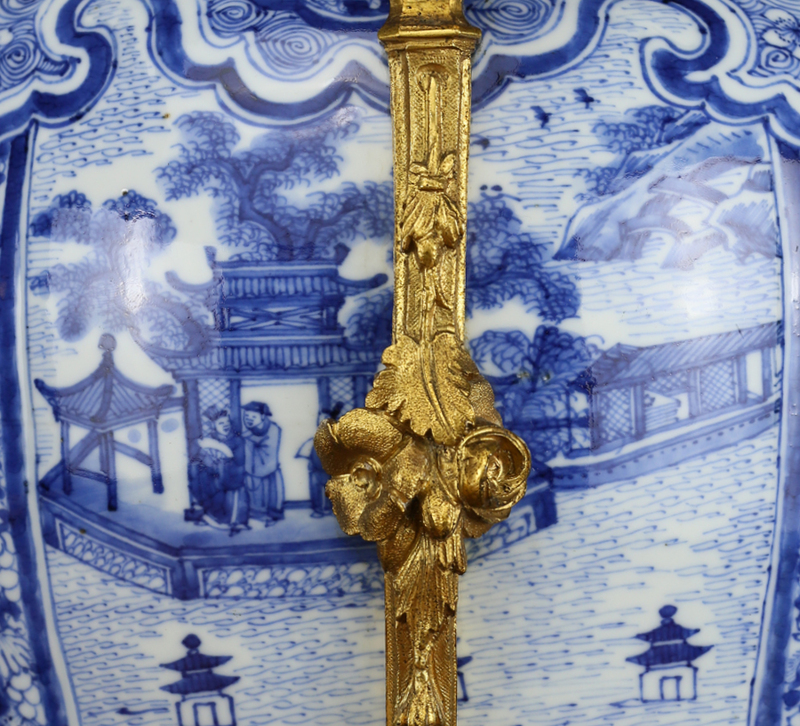 Due to significant health risks it posed to craftsmen (mercury was used in the gilding process), bronze ormolu ceased to be produced after 1830. 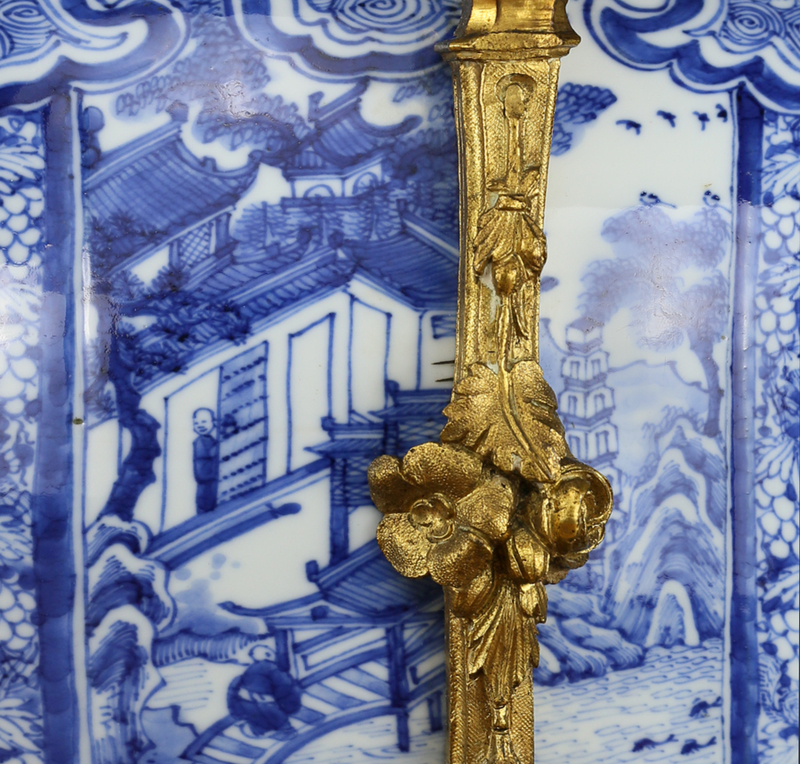 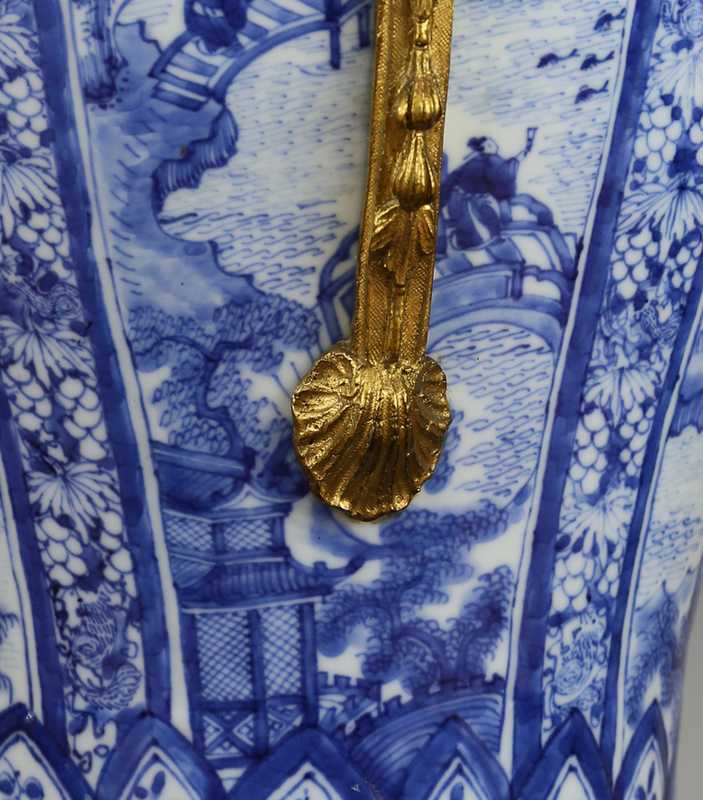 Ormolu mounting reflects the adoration with which Europe embraced Chinese porcelain. 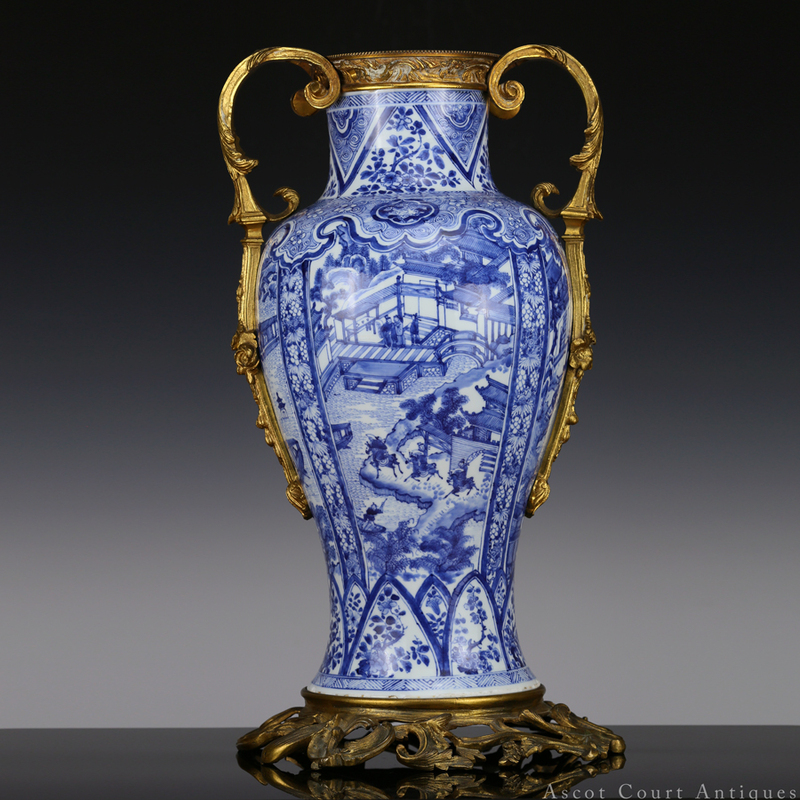 By encasing these objects in precious metals, owners and antiquarians hoped to protect the pieces from harm, enhance and augment their value, and better adapt their appearance to aristocratic European interiors.